Compassion: you can’t buy it but it’s free to give away. Compassion. It’s quite easy really. You see somebody less well off than you, in terms of possession or health, and you take the time to help them. That help can be material, it can be a supportive or an encouraging word, it can be tolerance and it involves understanding. It really isn’t difficult and it doesn’t have to cost anything. And indeed, as head of S2C I hear lots of example of compassion and see it in action where the most vulnerable people in our society are given support by very generous members of the community. The problem I have is that in recent times I feel like we have experienced an erosion of compassion in certain ways. The way our communities came together to help each other during the floods was a great example of compassion in action and those acts of compassion have made a massive difference to those effected. Where I encounter a deficit of compassion is in the day to day life of those struggling with mental health and physical health problems that cause them some impairment to being able to function properly in society. If you’re struggling to even get outside the house and fighting to cope with serious depression the last thing you need is a van driver winding their window down and shouting “Hey miserable, cheer up mate, might never happen.” It’s sometimes hard to explain just how your struggling and sometimes, those lucky enough to have never experienced such things, can make it harder. In my own personal experience, I find it hard. A mixture of illness, pain and medication means that every day I face a choice. I could lay about and do nothing all day. Instead I get out and do something to help others and myself. The consequence of that is by about 3pm on an active day the tiredness I feel is almost paralysing. The pain ramps up as the day goes by and I slow down, stop making sense and find it difficult to communicate well. I try to avoid being out and about for this. Sometimes though when I am I encounter some real ignorance from people disregarding you and looking at you like you are something they just stood in. Yesterday a service user from S2C who has a really horrible illness that prevents them being very mobile was driving to our session only to find the access to the unit blocked by a car parked there. After some beeping on the horn somebody finally arrived and was quite disrespectful and abusive considering they were blocking an access. Reluctantly they moved only to park back in the same spot. Hardly compassionate, unselfish or helpful. I know those reading this will for the most part already be compassionate in their daily lives. But just to those who maybe are not, or know somebody who might benefit from reading this, please consider this. The person you’re getting angry with who is going slow, getting in the way, mumbling, slow to respond, looking sad, hiding in a hood, asking you to move out of the way: maybe they are really ill and struggling to cope. Maybe smiling, saying a kind word, apologising for stopping them having access, taking time to listen, being patient, giving them a hand…..maybe that act might just be the best thing that happened to them that day. And lets face it…….you never know when you might need that help. The group took inspiration from the work of Gustav Klimt. We used cut outs of portraits for the heads then added colourful clothes and of course some gold paint. Some went off at a tangent creating really great images, portraits and designs. The two groups came together with a few away and volunteers on courses it was quiet. Some sewed, croched and did fabric work. Some carried on with 3D books. Some were doing a planning application! Others were drawing football inspired work. All in all a relaxing fun session. The group made little 3D books or scenes. This was done by folding long strips of card then cutting g out the top edge to create scenes. With some drawing and colour they looked very effective. At Space2Create on the whole we try to avoid being political. Our focus is on the people we care about and the community that we have of support and care. Occasionally things threaten that so you feel compelled to venture into the murky waters of activism or campaigning though it is not a comfortable place for any organisation who’s primary objective is caring. One example of this is the threatened closure of Kentmere Ward. This directly impacts on the people S2C supports and cares about so we have acted to support the campaigns to prevent or negotiate an alternative provision for in patient mental health care in the local community. One of the impacts of this on our Service Users has been the fear they have of what will happen to them in crisis when the ward closes.. Fear is a powerful force in a person’s mind and where that person is vulnerable it results in anxiety and a worsening of the symptoms of their illness. I find people I talk to, particularly those we care for struggling with illness. have a strong level of fear. unfortunately fear seems to be the political weapon of choice at the moment. Fear for our security, jobs, economy, safety, families. Across the world fear is being peddled as a political football where once you might have expected reasoned debate and argument. Fear is a powerful emotion. You will all know of the “Fight or Flee” response that is our human response to fear. We either run away to safety or stand and fight. The third one of these less mentioned is freeze where you are left incapable of either. History has taught us what a powerful tool fear is when taken to its extremes. Lets hope that after recent tragic events there will be more reasoned debate and less peddling of fear. Fear and ignorance sometimes go hand in hand. Back down to our local community, this week I have encountered both ignorance and bliss. Ignorance in the form of a Service User telling of being verbally abused in the street. Feeling very low and struggling to walk due to their medical problems they bumped into somebody. The person had been angry and the Service User became fearful and froze while the man ranted at them and called them “Mental”. Bliss because this week we have had a series of amazing comments and offers of help from people who have been amazed by the achievements of those attending Space2Create. They have praised the volunteers and Service Users for the work they do and more importantly, recognised the value of what they do in supporting the vulnerable and creating a safe, creative, caring and healing place free from fear. The group looked at using acrylic paint to create water effects. We looked at using brush strokes to show flow and also how being a colourless liquid the colours come from what’s underneath and reflections. Other types of shapes were explored, such as a linear city design, wher the buildings were set up with lines and dots. We had a very relaxed hour and a half, and we may continue with this project in other sessions. The group was mainly felting small pictures of animals and characters. This is done by having a base material, placing felting material on top and repeatedly stabbing with a needle. This merges the two and firms up the fibres. Others were creating colourful pictures and an application for planning permission! The group were making pictures from fake fur material. The outline was drawn on the back and cut out. Then more material was added to make the faces. Details were added using acrylic paint such as shadows and highlights. A really enjoyable session. Some of the DeafArt and Thursday Group members have started a new group. Every Thursday from 12-30 till 2-30 to work on sewing, stitching, knitting and other textile projects. All welcome. Today the group members working on blankets, hat making and felt pictures. Kevin led the session today continuing his geomotrees pictures from the ward. The group experimented with the idea and created some great images. If talk is so cheap why don’t we? Managers Blog: Mat reflects on talk or the lack of the right kind. In reflecting on my personal experience with severe mental ill health and the long road to recovery I can’t but help see the importance that talk has had in all of it. Talk and art I should say. Unlikely bedfellows as tools for recovery but they were. For me they always went hand in hand. Over many years with severe depression, not talking nearly cost me my life. Only after a couple of suicide attempts did I discover a voice that could help me sort out the mess in my head. The voice came through a pencil and pad brought to me by my wife in hospital. I discovered I could draw what was in my head and then I could talk about it. To this day some of my artwork draws on that experience and while it might not make for the most attractive or saleable artwork it sure helps me get myself in a good place and able to talk about the problems. Talk is so important in mental health. Too often we hear about mental health as a consequence. Something has happened, nobody knew, then we discover there is a mental health problem at the heart of it. How many things could be prevented if talking about mental health were as common as talking about our physical ailments. Imagine the workplace scenario…. “Hello Fred, how’s the back today?” , “Bit sore Bob…”, “Here Fred, let me get those boxes down for you”. How about we made mental health just as accepted? “Hello Fred, how are you feeling today?” , “Not too good Bob, feeling really low…not sure I can cope any more…” , “Here Fred, come and sit down, I’ll grab us a brew and we can have a natter…have you been getting any support….”. If somebody is hit by a car you call an ambulance. What would you do if somebody was having a breakdown? We often hear about suicide after it’s happened or been attempted. Too often what is talked about are the consequences of mental ill health, not the positives, or the successes or the great recoveries. The recent news around Kentmere Ward has had some interesting fall out in terms of talking positively about mental health. It is good that it is out there and being talked about. The amazing stories people have been telling about the positive impact the care of the staff has had on their lives as well as the fact that people with very serious mental illness have come out and felt able to tell their stories. 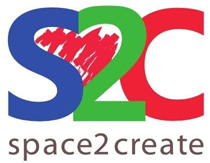 At Space2Create the environment is inclusive, caring and supportive. We do art, with benefits. The talk around the table. Mutually supportive, encouraging, accepting, non-judgemental, understanding. Something about being creative in a social group eases the stigma and relaxes the fear and people start talking. Sometimes on our Facebook page you will see just a few pics and the comments will be about how much talking has been going on. For me that counts as just as successful a session as one where ten beautiful artworks get created. The group had an interesting visit to Abbot Hall Art Gallery where Anne-Marie took us round the Laura Ford exhibition. As n unusual and intriguing exhibition which many of the group found inspiring. Some ideas about possible projects and artwork in the discussion. At the end Anne-Maria had us embellishing one of the artworks with small figures made HP from bits and pieces of Victorian images. On the ward we were creating monotone gradients using folded cartridge paper and then filling with paints & inks, making folds to mark where the different shades would fall. Some of us starting working in colour and using cross-hatching to give different effects and shades. A whole host of projects underway today. Knitting, fabric pictures, drawing, one person designing a house extension, sewing and more. Managed to only get three pictures not blurry! A busy and very chatty group today. The art was drawing g animals and then filling with coloured dots which looked very effective. Good session with a lot of laughs and chatter. Also some zentangling on the walls as we endeavour to do a giant room sized zentangle. Bits are starting to merge and the spaces getting smaller so if you want to have a go get in quick. Punch above your weight and change lives…. The last few days have seen the media dominated by the passing of Muhammad Ali. It has been interesting to see the attention rightly drawn away from the undoubted skill as a boxer but to the other side of his life. The massive impact on civil rights in the USA and here in Britain he had, the humanism and compassion, the charity and fighter for those less fortunate. Ali could certainly talk the talk but he could walk the walk too! A great boxing champion. What inspires me most though (to be honest I was never a boxing fan!) is that side of him that saw injustice and was willing to put speak out, stand up and do something about it. There is a lesson there for all of us. Very few of us will ever have the voice Ali had but we can still speak up. Injustice happens all around us and to stop it people need to speak out. One voice, however powerful and famous, can raise awareness. many voices can make a change. There is the boxing term about “Punching above your weight”. We can all punch above our weight and get out and make a difference to somebody. Perhaps you could sign the petition against the closure of Kentmere Ward and add your voice to the outrage. Maybe you could draw or bid on a postcard from the Card2Kendal flood appeal and raise awareness of how many people are still effected by the floods. Maybe you could volunteer a short time each week for one of the many charities in Kendal help those in need. Go on, be a champion. The group made a start on Zentanglethon. Covering the breeze blocks took some time but we were soon off and painting. Everything a bit stranded at the moment until it all gets filled wall to wall. Could this be the biggest Zentangle in Kendal soon! Some of the group started working on pieces for the Water themed exhibition (submission deadline 30th June). Collages and using fabric pattern books we have been donated creatively. Others were knitting, badge making and sewing. Colourful session this morning. The group just wanted to draw so out came the pens and off they went. Zentanglethon is making progress and slowly spreading round the room. Some great contributions from the group today. We are open on Saturday between 1-4 if anyone would like to add. Its not often you get a chance to paint on the walls!